I'll come clean right off the bat: I don't like the Adobe PDF Reader. Yesterday I found a new reason not to like it, which I expect will be the next Defensive Computing blog. But, while researching the new issue, I ran across yet another reason not to like the software: it consumes mass quantities of hard drive space, at least on Windows. On a Windows 8 machine that had no prior versions of the Adobe Reader, I did a fresh install of the latest edition, released last month, version 11.0.06. The software was downloaded from the official location, get.adobe.com/reader which said that the download was 48MB. Following the prompts however, you download a 1MB pre-installer called "install_reader11_en_mssd_aaa_aih.exe" and you never see or deal with the main 48MB installer. The software was installed to C:\Program Files\Adobe\Reader 11.0 which occupies 116 megabytes of hard drive space (this was a 32 bit copy of Windows 8). In contrast, my preferred PDF Reader, Sumatra, is 8MB and the PDF viewer embedded in the Chrome browser is 4MB. The pre-installer was deleted, but the fate of the main 48MB download is a mystery. But I suspected something was up before I started, so, before doing anything, I took note of the fact that the used space in the C disk partition was 17GB. Then, after downloading and installing the Adobe Reader, the C disk had grown to 17.4GB. More exactly, the used space increased by 406,261,760 bytes or 387.4MB. Not to rush to judgment, I found a Windows XP virtual machine that also had never had any previous installations of the Adobe Reader. This time, I copied the 48MB installer for version 11.0.06 into the XP VM. After doing so, the used space on the C disk was 3.84GB. Installing the software increased the used space to 4.24GB. The exact increase in space was 430,731,264 bytes or 410.8 megabytes. Installing the Adobe Reader on XP consumed 411 megabytes. An XP user that remembers to delete the installer, ends up with a bill for only 363MB. The main installation folder C:\Program Files\Adobe\Reader 11.0 was the same size on XP as it was on Windows 8, 116MB. It's that size on Windows 7 too. Then I tried the reverse. On a Windows 7 machine with the latest Adobe Reader installed the C disk occupied 25.3GB. After un-installing the Adobe Reader, the C disk shrank to 25GB, a savings of roughly 300MB (the Recycle Bin was completely empty before and after un-installing the software). 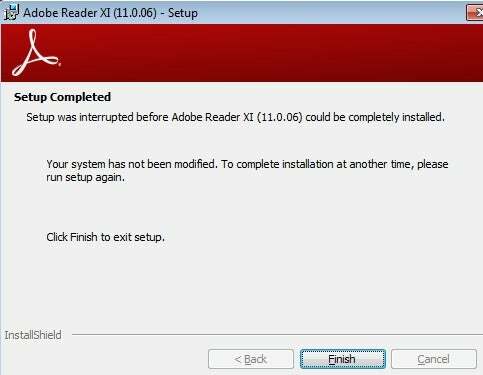 But, I needed this copy of the Adobe Reader for an upcoming blog, so I went to re-install it on the same Windows 7 machine. As on XP, I started from the 48MB installer. As you see below, something went wrong. The failed install had to be backed out. The final message (below) says that "Your system has not been modified". But it had been modified to the tune of 200MB. The C disk was now 25.2GB (the Recycle Bin was still empty). Two hundred megabytes for a failed installation. A little digging at this point revealed that the C:\ProgramData\Adobe\Setup folder was 144MB. I deleted it. The installation problem was nothing that a reboot couldn't fix. I tidied up a bit and set out to install the Adobe Reader again with the C disk occupying 23.8GB. I installed the software from a copy of the 48MB installer on the D disk. After the installation, the C disk had increased to 24.2GB. It had grown by exactly 405,479,424 bytes (a.k.a. 386.7MB). The Programs and Features applet in the Control Panel on both Windows 7 and 8 report that the Adobe Reader occupies 128MB of space. Windows XP reports that it is 129MB. The big question then is: what about the other 260 some odd megabytes? That's a lot of space unaccounted for. Update: Feb 6, 2014 11pm ET. My first go round failed to take into account the Windows Restore Points that the Adobe Reader creates when it is installed. To account for this, I re-installed the software a second time with System Restore disabled. The space usage numbers have been revised, both to reflect the lack of restore points and to replace estimates with exact numbers. Without restore points, the space used on Windows 8 was reduced from an estimated 600MB to 387MB. On Windows 7 it went down from 519 to 387MB. Windows XP was run in a virtual machine that already had System Restore disabled. A second installation of the Adobe Reader went from an estimated 400MB to an exact 411MB. Update: Feb 10, 2014. Revised Windows XP numbers to correctly reflect the deletion of the 48MB installer. Added final paragraph wondering about the unaccounted for space.